The president invited some black pastors to the White House. They just sat there and told him how great he was. I have some Bible reading for them. Black people cannot stand Donald Trump. I don’t mean there is distaste for his policies and his Twitter outbursts. I’m talking about a feeling of anger that knows no bounds. Sure, it’s easy to find a small percentage of African Americans who swear allegiance to him and the Republican Party, but for black folks in general, Trump is a name that is more despised than Supreme Court Justice Clarence Thomas, and that is no small feat. Calling basketball icon LeBron James and CNN’s Don Lemon dumb after their recent interview. That’s why when a group of “inner-city pastors”—that was how the White House labeled it on the transcript—met with Trump recently, the criticism from black America was fast and furious. Many were most angry with Cleveland pastor Darrell Scott, a staunch Trump supporter, for saying he was the most pro-black president he had ever seen in his lifetime. What rankles black folks is the genuflecting to the feet of Trump, and not any effort to hold him accountable for his words and actions. The job of pastors isn’t to go to the White House and kiss the ring of the president of the United States. It is to bring a prophetic Word into a partisan and political setting. And there is biblical precedent for this. When King David slept with Bathsheba and sent her husband, Uriah, to the front lines of battle where he was killed, it was the prophet Nathan who told the king he was wrong and God would hold him accountable for his actions. When Saul was anointed King, it was the prophet, Samuel, who God commissioned to do so. And when Saul continued to run afoul of God’s directives, Samuel was sent to speak truth and power to him. Why did Nathan and Samuel talk to kings this way? Because they served a higher power than these earthly kings. And that is what was missing from Trump’s meeting with black pastors (and the same goes when he meets with white pastors). It doesn’t matter that 94 percent of black women and 85 percent of black men voted for Hillary Clinton over Trump. We are constituents, and it is our right to be treated like every other citizen. And it also doesn’t matter if this meeting was specifically around prison reform. When those cameras were rolling, there should have been at least one pastor with a prophetic word who would issue a rebuke to Trump over his words and actions. You mean to tell me not one pastor had the courage to tell Trump to stop talking about Chicago violence if he was unwilling to go to the people and hold a town hall there? Not one pastor had the gumption to tell Trump that the NFL players were protesting police brutality and not the flag or anthem? You mean to tell me not one of these black pastors had the prophetic fire in their belly to tell Trump that his policy of dealing with the children of illegal immigrants was morally indefensible? Not one black pastor had the guts to tell Trump that he and the GOP are wrong to support voter suppression? And now we know the meeting was a photo op and a colossal waste of time. On Thursday, prison reform hater, Attorney General Jeff Sessions, released a statement praising Trump for not backing the reform bill before the midterms. Instead, we watched a group of black men so happy to just be sitting at the table that they forgot to represent the people they serve in their congregations. Donald Trump should be meeting with black pastors. And members of the black Press. And civil rights leaders. And black entrepreneurs. But if anyone of us is going to sit in a seat of power, we need to be willing to speak truth to power. This is not a moral dilemma. It is just and right. These black pastors are catching a lot of flak at home for their obsequious behavior. Instead, they should have been obedient to the Word and been willing to tell Trump the truth. And if they won’t, then stay at home because all you’re doing is wasting our time. 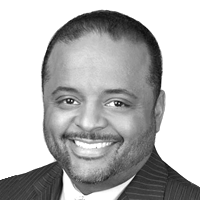 Roland Martin is senior analyst for the Tom Joyner Morning Show and host and managing editor at TV One Cable Network. On Sept. 4, he is launching a daily digital show, #RolandMartinUnfiltered. Go to RolandMartinUnfiltered.com for more information.